‘For much of my life, I have been a Deaf writer and artist in some shape or form. I am passionate about freedom of self-expression and it is this that has fuelled a varied body of work across the media and arts spectrum over twenty years, with a particular focus on reviews, published journalism (The Independent, Vogue, Disability Arts Online) and creative documentary film-making. 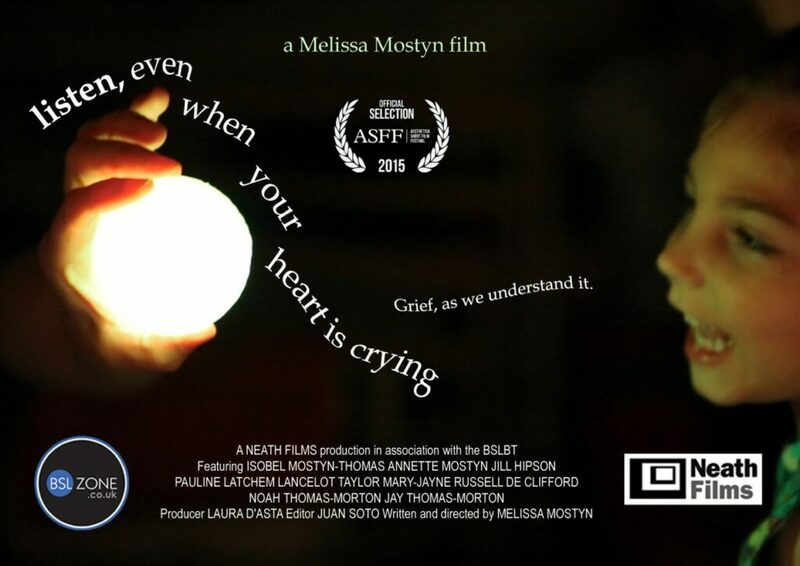 I am best-known for three projects: Listen, Even When Your Heart is Crying, an online and TV documentary that explores grief from a Deaf perspective; My Daughter And I, an e-memoir that grew out of a parenting blog that I kept for three years; and Salon, a non-for-profit grant-funded deaf conceptual art organisation that I managed in partnership with mainstream arts organisations for five years. For reasons which I’ll come to later, it’s important to know that I am a parent of two, including one with a disability. I am often asked how I came to be able to write at the level I do. I always find it hard to explain because I know it’s not necessarily a skill that comes easily to pre-lingually deaf people. In the first instance, they have to work harder to get to grips with a language that is simply not as accessible to them as British Sign Language (BSL). It’s symptomatic of a mainstream society that expects everyone to conform to certain ‘norms’ or ideals, rather than let them be themselves. In general education, as I understand it, English is taught orally as well as in written form. Schoolchildren often learn to make sense of what they’re reading through what they’re picking up aurally. Not for nothing do they get asked to read aloud in class. This is one of the earliest times that drove home the message that I was not like other children. From a very early age – thanks to the partially hearing unit (PHU) attached to the mainstream primary school that I was placed in – I understood and readily accepted my difference. I guess that is the advantage of someone who became deaf so young. An official school photo to mark the occasion when Melissa at the age of 5 acquired speech. I’d learnt to string together about five words at 16 months, but I wasn’t old enough to understand what I was saying. (This is significant. Language only really comes together once the child attaches cultural meaning to the words being conveyed.) Then I became deaf from meningitis – and didn’t speak again until I was five. I was lucky. 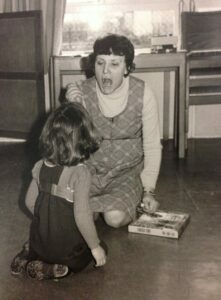 During the benighted ‘70s and ‘80s, BSL was banned from deaf education, so my relatively early acquisition of speech was deemed miraculous. Research suggests that if children have not acquired language by age six, they never will. I had no Deaf identity, despite spending seven years with other deaf children at the PHU. I enjoyed communicating with them using what would probably appear to be the bare bones of BSL today, but due to the lack of signing deaf role models, I thought – misguidedly – that it wouldn’t go anywhere. I was bored in the PHU. Local state deaf education was poorly funded, oralist of course in approach, and of a low standard; I don’t think the local authority had high expectations of deaf people. Every weekday in term-time for seven years, I sat in just the one room with children whose ages ranged from four to 11. I didn’t socialize much with my mainstream peers either. Most of the time, I attracted interest by wowing them with my emerging creativity in Art classes. In the playground, I had just one hearing friend who was kind and inclusive enough to try and involve me in other children’s games. I never knew her name. Discussing these memories feels strange in lieu of my background. I am part of an extended family of writers and artists, so communication should have been a given. 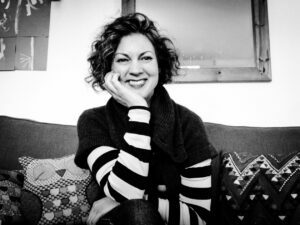 Sara Banerji and her brother Trevor Mostyn, both of who are authors descended from Henry Fielding – writer of Tom Jones – and the painter James Hart-Dyke, are cousins. The Royal Academician Humphrey Ocean, also a cousin, painted a wall-to-wall mural for my childhood playroom; meanwhile his sister Sarah Ravenscroft, my godmother, herself a fiercely independent and artistic woman who dyed her black hair flame-red when it turned white, regularly posted me literary fiction for my birthday and Christmas. Both my parents also painted, occasionally. They had side businesses in trompe d’oeil furniture and wooden handmade bird mobiles when I was growing up. My mother still sculpts in clay. My father encouraged me to keep holiday scrapbooks in my early years. He’d stick in postcards, cut-outs of maps, family snaps and so on and get me to either fill in the gaps or copy the words, while my mother fed my voracious reading habit by getting me library copies of Anne of Green Gables – the entire series. 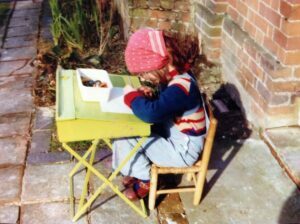 Melissa at at her desk in the sun at home, aged six or seven. All of this fed into a lifelong interest in art, literature, fashion, creativity, eye-popping colour and, of course, self-expression, and may be the reason why my personality developed the way it did. I love being around creative people, but I also love escaping into my own world. 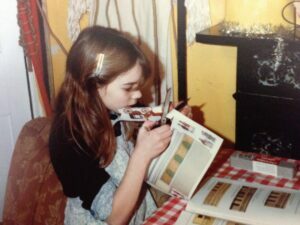 Looking through the family photo albums and Super-8 holiday films that my father made, you can often see me reading, writing, crafting on my own. Of course, most creative people tend to live in a bubble, but I think mine was rather fortified. Many deaf people from hearing families will be familiar with the experience of feeling left out at the supper table. My response was to clean the plate, excuse myself early, and go off to make Plasticine figures, knit Kaffe Fassett patterns, work on Super-8 animations, or watch television. The need for escapism manifested itself in school too. At the PHU, we were given educational textbooks in reading, writing and spelling at different levels according to age and ability, the most advanced being level seven. By age nine or 10 – a year or so before I was due to advance to secondary education – I’d already gone through level seven three times. The teachers of the deaf didn’t know what to do with me. Melissa about eight, making a 3D Victorian house out of a paper kit. On days when I had absolutely nothing to do – which were often – I’d potter into the PHU’s storeroom where they kept a huge variety of art materials as well as toys. There I’d pore through back issues of Vogue and mail-order catalogues kept for photo-collages. Yet my deafness gave me diversity from the family itself. I am a banker’s daughter who had a well-to-do Catholic upbringing, yet instead of attending a fee-paying private secondary school as day pupils like my two sisters did, I went to a deaf boarding school 40 miles away where I got to meet people from a wide variety of backgrounds. There, efforts were made to deny me and my fellow schoolmates opportunities to align ourselves with Deaf Culture. My supposedly near-perfect speech ensured that I never joined those who got detention at the end of term for signing, or perceived ‘signing’. (Few teachers at the boarding school had signing knowledge of any sort.) Nevertheless, BSL bounced back into my life, ripe with forbidden-fruit irresistibility. By the end of my first three weeks at secondary school, I’d already learnt the fingerspelling alphabet from a classmate in a loo cubicle. It felt as surreptitious as smoking. Unbeknown to me, I needed it. My hearing levels had dropped unexpectedly just before I began secondary school – and in my first year I was labelled a daydreamer by my form teacher because I couldn’t understand what she was saying. The older I got, the more I got into my writing. It is amazing what a human being will do to compensate for the opportunities they know they have been denied. Not until 2003 – when I began working for the first time as part of a mixed hearing and deaf team and, joy of joys, a qualified sign language interpreter – did I realise how poor a substitute the written word was for verbal communication. It took me that long to properly embrace the intrinsic Deaf identity within me because I’d been surrounded by so many people who didn’t believe Deaf Culture existed. I cannot speak for those deaf people who choose to speak and not sign. But I choose to present myself as a bilingual (BSL/English) Deaf person because that is how I feel whole. It enables me to make the most of the communication options I have available. When obtaining timely and crucial information on an everyday basis is an on-going issue, why shouldn’t I? There is no point in me trying to be some kind of pseudo-hearing person when so much of my growing-up was shaped by my being deaf – the medical attention I had, the equipment I used, the schools I attended, the people I got to know, the attitudes I experienced. Being deaf is a part of me, just like my writing and creative efforts are. I see no shame in simply being who I am. Melissa with Isobel and Benedict. At the moment, due to single parenting commitments (my youngest, Benedict, is not yet at school), I am unable to indulge in the creative endeavours that I love, but I don’t mind. For much of my life, my self-expression stemmed from an urge to communicate beyond language, draw attention to myself. Then in recent years, I had crisis after crisis, sometimes in collision or quick succession: depression, grief, heartbreak, domestic abuse, anxiety, family estrangement, ground zero. I became a parent-carer to a disabled child – Isobel, who was diagnosed with cerebral palsy at one year old following a traumatic home birth, and on-and-off petit mal seizures – and needed a new catharsis. I wasn’t able to explore the arts like before; I was in a completely different mindset. I took to baring my soul instead. 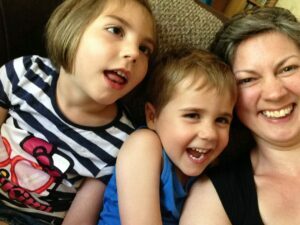 I blogged about Isobel, my feelings as a Deaf parent, and where it all fitted. I gave raw presentations, in BSL, at Women of the World Festival at the Southbank Centre, a deaf school, and two major conferences, one of which was NHS Safeguarding. 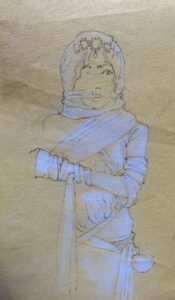 An untitled pen and chalk sketch by Melissa that explores the idea of a retreat into a private space (2004). Through all of that, I not only regained confidence but built on it, which I believe is unleashing a richer creativity, born of not just catastrophe and having two languages, but also two children: one disabled, one not. Benedict is giving me as much food for thought as his big sister is. Thanks for sharing the layers of your journey, Melissa — a keyhole view of how you got to here.